A second unit. Image from Decker Bullock. Though the pages of this blog are often critical of the so-called “slow growth” philosophy of development stasis, its activists hold up second units as a solution to our housing crunch. While I won’t go so far as to say it is our only solution, they are certainly part of the mix. Marin’s housing market is faced with two housing shortages. It is part of the overall shortage of housing in the region – the cause of the troubling spikes in rent in San Francisco, major displacement of the poor in Oakland, and threats to our open space in the far East Bay. 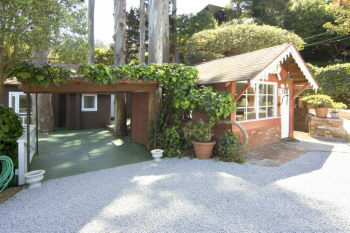 The other shortage is a local lack of small units, namely studios and one-bedrooms, in Marin. This has meant a steady increase in small-unit rents at a faster rate than either wages or the county’s rental market at large. Second units offer a way to deal with both without dramatically altering the appearance of our neighborhoods. Though regional trends will be a far greater weight on our overall housing costs than new development, it would help solve the problems in our county’s submarket. And, for the region at large, it would allow some housing development to ease North Bay demand. I say this is a point of agreement with slow growth because, well, they’ve said it often. Frequent TGM commentor Richard Hall certainly thinks so, with comments all over the place about it. Bob Silvestri, too, came out in favor of this strategy in his book (PDF, page 51). The IJ and Patch comments sections are rife with other examples. My initial concern about allowing this sort of infill development was that it isn’t targeted, but actually that’s just fine. The reasons for the current ban on in-law units are familiar: traffic and parking. Planners feared that allowing second units would cause residents to park on the street (a big no-no in the 1970s) and put undue stress on the big arterial roads like Freitas Parkway and San Marin Drive. But really, most of Marin’s mid-century sprawl and early 20th Century development is well-suited to the distances traveled by walking and biking. Shopping is typically within a half-mile, as is a bus line. There should be more than enough capacity in our neighborhoods for more small units. To make this reality, two big changes should happen. First, the state needs to recognize second unit expansion as a viable method to expand affordable housing under its RHNA affordable housing structure. At the moment, it is not. Second, towns and cities need to allow second units in their residential neighborhoods, preferably targeted in areas that are within walking distance of transit and shopping. Conversion of existing structures should be allowable by right, in other words buildable without more than city staff approval. New construction might go through a planning commission process, perhaps requiring approval from adjacent neighbors. To really be affordable housing, towns and cities would need to ensure at least some units are built. To do this, they should offer incentive programs to householders who want to build the units. New buildings can be expensive to build well, and incentive programs would ensure these units are of good quality. Just lowering the permit fees could do the trick. If the county makes it easy for these amateur landlords to take Section 8 vouchers, it would be a major boon to Marin’s affordable housing needs. Because of the acrimony between the slow growth and smart growth factions in Marin, it’s imperative we embrace the areas where we can work together for a common goal. Second units are the area where we can, and where we must. If Republicans and Democrats can come together for a budget deal in the US House of Representatives, surely we can come together in our living rooms, pubs, and town halls. And, since the end result would be a greater Marin, that’s something we could all celebrate.